Food Costs > How Much Does a Dozen Bagels Cost? How Much Does a Dozen Bagels Cost? 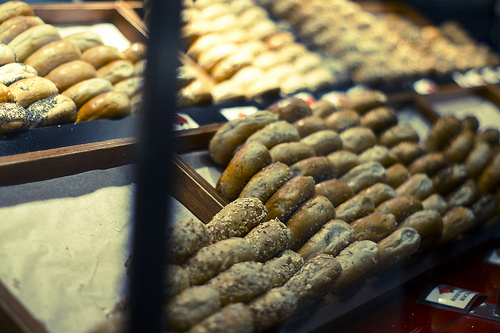 When it comes to buying a dozen bagels, customers can select from an assortment of bagels, similar to a dozen donuts. Depending on the restaurant or bakery, you can customize your dozen with your preference of a signature, classic or gourmet topped bagels, along with a side of cream cheese. On average, the prices of a dozen bagels will depend on the restaurant and type of bagel you want to purchase. On average, one dozen bagels will cost about $7 to $15. The gourmet-topped bagels may cost 30 percent more depending on the company’s pricing structure. With a handful of chains offering a dozen bagels for sale, refer to our table below to see what they charge. Cream cheese, depending on the store policy, can be an additional cost. Each cream cheese spread could cost about $0.50 to $1.50 each. A tub could be $2 to $4. As stated above, gourmet bagels could cost 30 percent more than the standard bagels. Taxes may not be included. In addition to the plain bagel flavor, other popular flavors include poppy seeds, garlic, sesame seeds, kosher salt and toasted onion flakes. Depending on the bakery, you may also find flavors that include cheddar cheese, parmesan, gingerbread, cinnamon sugar, strawberry, cranberry, blueberry, chocolate chip and more. You can even get different flavors of cream cheese to put on top of your bagels such as chive and onion flavors. Bakeries often have the “baker’s dozen,” which consists of 13 instead of 12. Many franchises offer coupons or special offers. For example, in the past, we were able to find a $6 dozen bagel deal at an Einstein Bagel on Tuesdays. Check out their social media accounts or official website to see if there any deals available. It also doesn’t hurt to join their email list for future deals. Try to stick with the plain bagels to save the most money. A dozen bagels at the local grocery store is often cheaper than the bakery, but the flavors may lack when compared to a local bakery or chain.